Artificial connectivity … have we overlooked the native range? Invasive species are problematic throughout the world’s ecosystems, down even to their very name which incites heated debates. Every month, studies are published that describe the genetic structure and gene flow of non-native species in their introduced ranges. Often, these studies include native populations and try to trace the origin of an invasion. You’re in luck if there’s lots of structure in the native range as it increases the chances on stumbling onto patterns. But, do we often think about the impacts of human activities on moving species around in their native ranges even before they get moved to a non-native range? We know that human activities are responsible for altering patterns of dispersal and gene flow.We can guess that anthropogenic transport will eliminate IBD and substantially alter genetic composition regardless of whether a species is moving about in its native range or its non-native range. But, why don’t we look at these impacts more frequently in the native ranges of non-native species? Hudson et al. 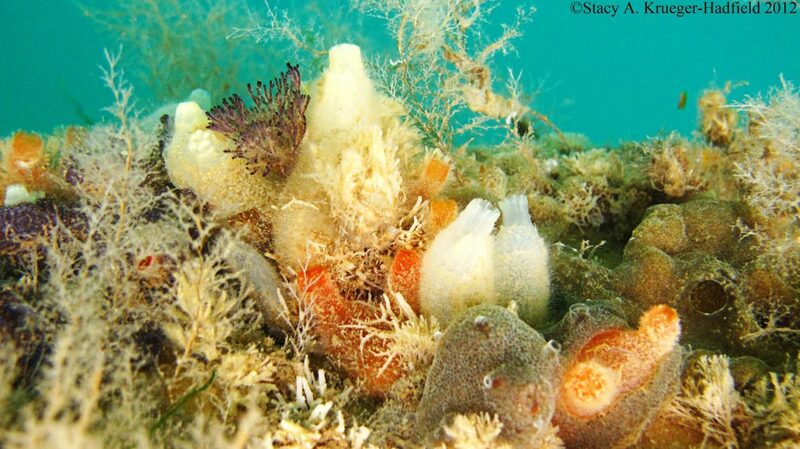 (2016) looked at anthropogenic transport in the sessile marine invertebrate Ciona intestinalis. Populations in the North Atlantic, Ciona‘s native range, should show high levels of population structure and patterns of IBD due to its limited dispersal potential. But, Ciona is a frequent lodger on artificial substrata, such as in marinas. In fact, it is often hard to find Ciona on natural shores. Hudson and his co-authors found low genetic differentiation among sites separated by both short and large distances, suggesting anthropogenic movement of genotypes rather than the influence of natural barriers, such as distance for a poor disperser like Ciona. Yet, among some sites, they found significant differentiation that suggested other mechanisms at work than artificial movement, such as natural dispersal. These results clearly highlight the unpredictability of genetic patterns in urbanized areas, such as the incredibly connected English Channel. Indeed, the native range, dare I say a range often overlooked, could be the result of a complex interplay of natural and artificial dispersal that shapes genetic structure across spatial scales. The artificial transport of species whether in the native or non-native range alters evolutionary trajectories by decreasing inbreeding depression and disrupting patterns of local adaptation. But, it is such artificial connectivity in the native range for which we do not understand the consequences for both native and non-native species ranges. This entry was posted in adaptation, conservation, evolution, natural history, phylogeography, population genetics and tagged Biological Invasion, Ciona, Evolution, invasive species, marine, Sessile. Bookmark the permalink.